With just a handful of recipes to go before the French Fridays with Dorie crew finishes cooking all the recipes in Around My French Table, some of the recipes left are where they are in the lineup due to deliberate procrastination. A case in point would be this week’s choice: Cabbage and Foie Gras Bundles. As it turns out, this elegant starter might be even simpler to put together than its name describes. Foie gras is wrapped in boiled cabbage leaves and steamed to warm the liver. I’ll admit that I felt great ambivalence on this one. I wasn’t inclined to make a major investment in ingredients, so I didn’t put much effort into searching for the foie gras terrine. When we made the coddled eggs that called for foie gras mousse, I had great luck with the chicken liver mousse from Trader Joe’s, so I just bought that again. Of course, I didn’t read the recipe header where Dorie said to use a terrine made with whole foie gras not chopped or mousse. Oops. My misadventure continues. The first step is to boil the leaves to soften them enough to be able to wrap up the foie gras into bundles. I couldn’t find Savoy cabbage, though I’m sure the softer, more tender leaves of Savoy would have been easier to separate from the head. Leaves on the regular green cabbage I bought are stiff. 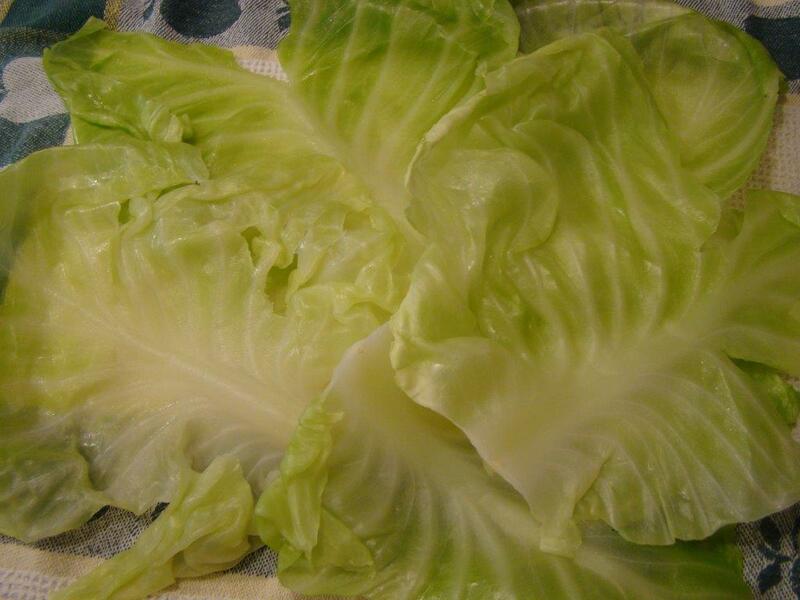 As I removed each leaf off my head of cabbage, it tore. 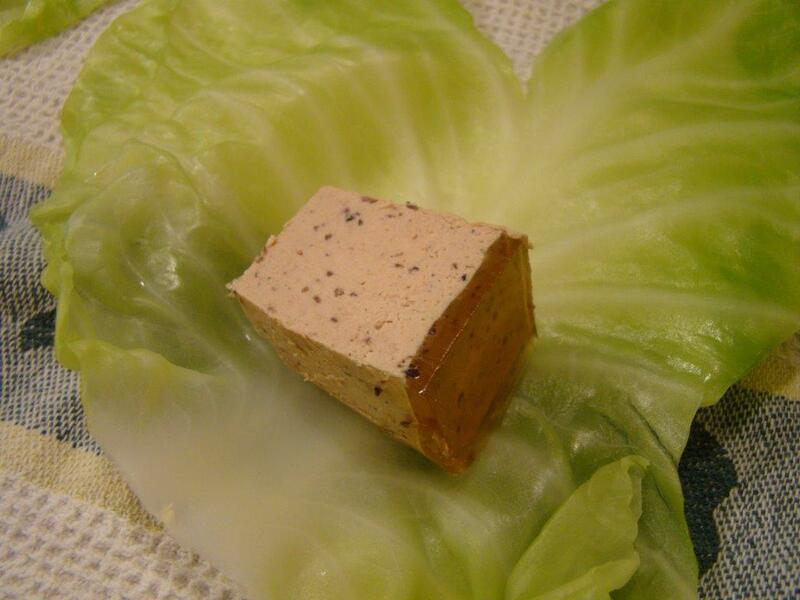 So, I have torn cabbage leaves and the wrong kind of foie gras terrine. Next step, I wrapped thick slices of liver mousse in the softened cabbage leaves. Fortunately, those cabbage leaves are more forgiving than I thought and I had bundles, ready to steam. Nothing really needs further cooking. The steaming step is intended to warm the filling. The mousse being more delicate than what was really called for, I only steamed the bundles for 2 minutes. Now, transfer to the plate, drizzle with extra virgin olive oil, and sprinkle with fleur de sel. Voila! 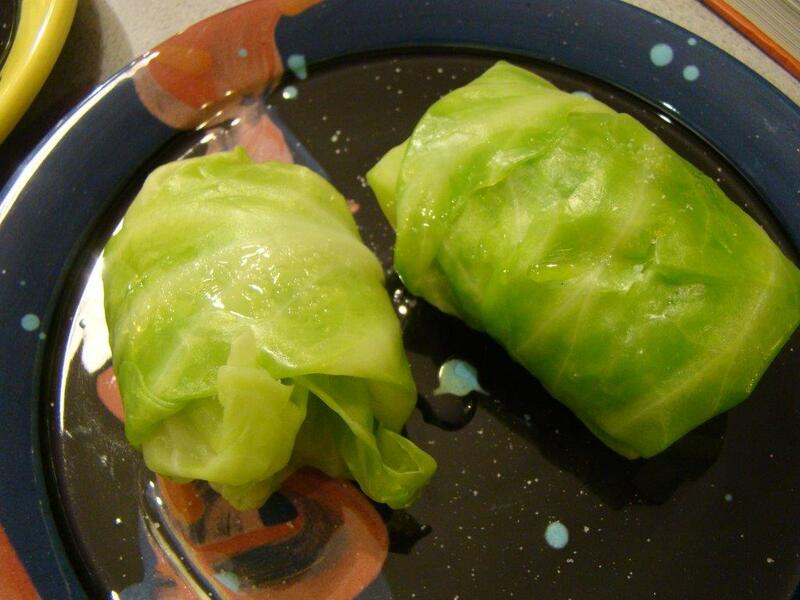 Howard’s been trying to get me to make his grandmother’s stuffed cabbage for years. 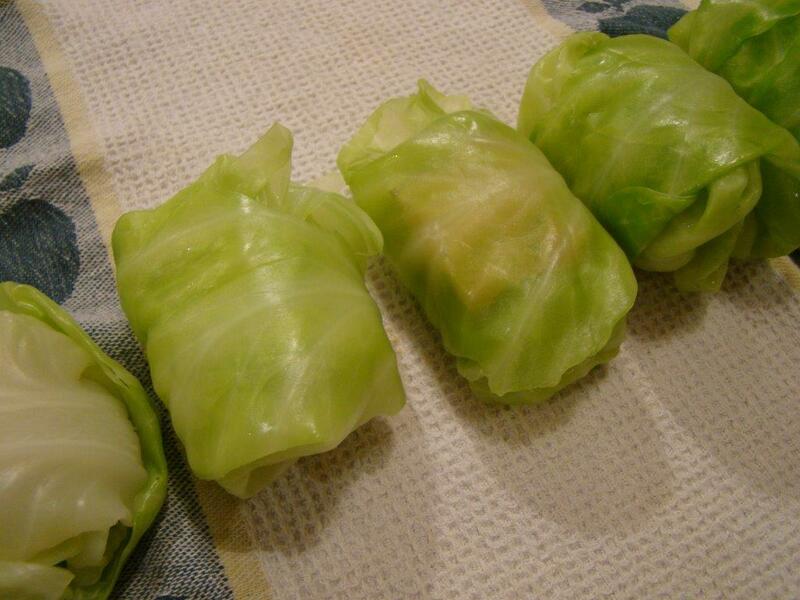 These bundles are Not Your Grandmother’s Stuffed Cabbage, but they are tasty. Howard really liked them. I don’t know that I’d make this again, but it was worth trying. If you want to see what my French Friday friends thought of their bundles, check their links here. After our starter, we enjoyed leftover Chicken Parmentier from the latest Everyday Dorie column in the Washington Post. If you haven’t tried it yet, you should! Posted on 6 March 2015, in French Fridays with Dorie and tagged appetizers, cabbage, French Fridays with Dorie, liver. Bookmark the permalink. 15 Comments. Glad to hear Howard enjoyed this one! You’ll have to wait until at least April for that one… No-fish March! I didn’t think the end result was going to be that you both liked them. (I just re-read your Post. Howard liked them. Did you?) Diane Z. also made Chicken Parmentier and said it was good. If you don’t get the Washington Post, do you just go online and get the recipe? Is it included in her article? Your little bundles actually look very pretty, Betsy. The link on Everyday Dorie column should bring you to the article in the Post. The article has a link to the recipe. I think you’re right with “worth trying”. Glad Howard enjoyed it. Hi Betsy, looks like a nice creative take and an enjoyable meal all around. Definitely a (mis)adventure! But that’s why we signed up for the project, isn’t it? You two are so brave! We just couldn’t being ourselves to try this one! I have to admit, they weren’t as bad as expected. I only made four. I knew Jim wouldn’t touch them. I’m sure with the right filling they would have been better. A Howard approved recipe??? Whoa, good for him!!! Good to know that Trader Joe’s carries this product. I have never had foie gras and have not been interested but maybe I need to try. Stuffed cabbage sounds good since you can put anything in it. I used to like stuffed bell peppers too. Have a great week. I forgot, thanks for the potato recipe! Betsy, you and I are of the same mind: it was fine, but not something I’m likely to make again! It looks beautiful, though, and thank goodness it was easy to make! I’ll have to try the coddled eggs with chicken liver. Now that dish is yummy!